The purpose of information security is to protect an organisation’s valuable assets, such as information, Intellectual property, hardware, and software. Through the selection and application of appropriate safeguards or controls, information security helps an organisation to meet its business objectives by protecting its physical and financial resources, reputation, legal position, employees, and other tangible and intangible assets. In this A to Z I’d like to outline some of the key focus areas for organisations wishing to pursue compliance to the ISO27001 Information Security standard. Like other ISO management system standards, certification to ISO27001 is not obligatory. Some organisations choose to implement the standard in order to benefit from the best practice it contains, while others decide they also want to get certified to reassure customers and stakeholders that its recommendations have been followed. Customers are increasingly asking for certification of their suppliers and for that reason many suppliers are also demanding certification of their supply chain. Achieving ISO27001 Certification does require an investment of time, effort & budget from an organisation, but there are significant regulatory, commercial, operational & reputational benefits that will repay the initial investment several times over. ISO27002 is a code of practice – a generic, advisory document, not a formal specification like ISO27001. It recommends information security controls addressing information security control objectives arising from risks to the confidentiality, integrity and availability of information. Organisations that adopt ISO27002 must assess their own information security risks, clarify their control objectives and apply suitable controls (or indeed other forms of risk treatment) using the standard for guidance. Just as ISO 27002 provides a set of guidelines for best practice in implementing an Information Security Management System (ISMS), ISO27005 provides best practice guidelines for risk management. Preventative – prevents impact upon an asset. Detective – detects impact upon an asset. Corrective – actively reduces impact. Recovery – restores an asset after impact. Controls may reduce information security threats or impacts, although most reduce vulnerabilities. Implement appropriate technology that will keep data safe and secure, taking into account the state of technological development, the cost of the technology, the nature of the data that is being protected and the harm that might result from a security breach. Hire reliable staff and take steps throughout their employment to ensure their reliability. This will extend to pre-employment vetting and ongoing monitoring where appropriate. Use data processors who provide sufficient guarantees about security, who agree to work only pursuant to a contract and who agree to process data only on the controller’s instruction. The controller must take appropriate steps to ensure the reliability of the processor. Collectively these provisions address all the major themes within a comprehensive information security management system, and they dovetail nicely with the headline requirements of ISO27001. Many employees do not understand what information security is all about. You need to explain to your colleagues why information security is needed, the implications of not putting controls in place and how to perform certain tasks. In addition to training, awareness must give an answer to the question “Why?” – that is, explain to your employees why they should accept information security as a normal working practice. Include employees in documentation development – before you publish the documents, ask your employees to give their inputs. Presentations – organise short meetings, conference calls or webinars where you can explain what new policies and procedures are being published and ask your employees for opinions about them, as well as clarify any misunderstandings. Articles on your intranet or internal newsletters – simple stories (with as many examples as possible) that can help employees understand why information security is important. E-learning – you can create short online training modules that explain the significance of these topics, as well as train your employees in spotting key areas of risk and how they can help mitigate them. Videos – they are a very powerful presentation method – you can distribute them via email, through the intranet or use them at team / company events. Team Meetings – use regular meetings that are organised in your organisation to briefly present what you are doing and how it affects your colleagues. Day-to-day conversations –you have to sell the idea of information security / business continuity. No matter which of these methods you use, you should prepare some kind of a plan where you should define which of these methods you will perform, and how often as well as regular measurement as to how effective they are. Information security governance is the system by which an organisation directs and controls Information security. It also describes the process of establishing and maintaining a framework to provide assurance that information security strategies are aligned with and support business objectives, are consistent with applicable laws and regulations through adherence to policies and internal controls, and provide assignment of responsibility, all in an effort to manage risk. In simplest terms, it’s a subset of the (even more grandiose sounding) discipline of corporate governance, focused, unsurprisingly on information security. As discussed later senior management’s fundamental commitment to information security is the most important aspect of effectively managing the security risk to an organisation’s information assets also referred to as leadership duty of care or due care. To be successful information security governance activities must be driven by the board of directors, senior management and designated key personnel. These activities should be undertaken in a manner consistent with an organisation’s risk management and strategic plans, compliance requirements, organisational structure, culture and management policies. A key aspect of security governance is the need to define decision rights and accountability. Achieving this both in theory (the organisation is clearly defined) and practice (everyone knows what to do and how) requires the right culture, policy frameworks, internal controls and defined practices. The role of HR is key to an organisation’s information security health, which is why ISO27001/2 has a section dedicated to all matters HR. It not only outlines possible information security controls, but also includes vital implementation guidance in each of its sections related to the employment life-cycle, providing advice in relation to pre-employment, employment and post-employment activities. The pre-employment section covers areas such as screening or vetting and contracts/terms and conditions. As an example, as part of the step-by-step guidance on screening, it includes information on how to establish what criteria and limitations should be used for checks and for handling sensitive data such as personal financial information. It also covers how best to identify who is eligible to carry out such checks. During employment, all staff members have a duty of care towards their organisation’s information assets. The IT department is usually expected to take care of security but, in fact, it takes care of IT security. The scope of an organisation’s information assets are much broader and are subject to a great many higher risks than IT can reasonably be expected to cover. It is generally accepted that around 80% of organisational data breaches are caused by people rather than technical failure. This may be the result of staff using USBs to carry data that perhaps they shouldn’t be. The post-employment period is a very risky one in terms of organisations’ information security. They can end up being the target of malice, theft or reputational damage. While not every organisation would face the same level of threat over losing protectively marked data, the Information’s Commissioner’s Office is very keen to show its displeasure over such incidents these days – and with possible fines of up to £500,000, a serious data breach could actually close some businesses. ISO27002 offers clear guidance on suitable policies and procedures for the termination process, which includes advice on how staff should return assets and on how best to remove their access rights. It also offers clear guidelines on how to implement such policies. Adequate resources (people, time, money) should be allocated to the operation of the Information Security Management System (ISMS) and all security controls. In addition, the staff who must work within the ISMS (maintaining it and its documentation and implementing its controls) must receive appropriate training. The success of the training program should be monitored to ensure that it is effective. Therefore, in addition to the training program, you should also establish a plan for how you will determine the effectiveness of the training. Specific documentation is not required in the ISO standards. However, to provide evidence that resource planning and training has taken place, you should have some documentation that shows who has received training and what training they have received. In addition, you might want to include a section for each employee that lists what training they should be given. Also, you will probably have some type of procedure for determining how many people, how much money, and how much time needs to be allocated to the implementation and maintenance of your ISMS. It’s possible that this procedure already exists as part of your business operating procedures or that you will want to add an ISMS section to that existing documentation. The leadership and management team of an organisation plays an important role in the success of an Information Security Management System. Management must make a commitment to the establishment, implementation, operation, monitoring, review, maintenance, and improvement of the ISMS. Commitment must include activities such as ensuring that the proper resources are available to work on the ISMS and that all employees affected by the ISMS have the proper training, awareness, and competency. Roles and responsibilities for information security; a list of the roles related to information security should be documented either in the organisation’s job description documents or as part of the security manual or ISMS description documents. Announcement or communication to the organisation about the importance of adhering to the information security policy. Management to review the ISMS at planned intervals. The review must include assessing opportunities for improvement, and the need for changes to the ISMS, including the security policy and security objectives, with specific attention to previous corrective or preventative actions and their effectiveness. Periodic internal audits – The results of the reviews and audits must be documented and records related to the reviews and audits must be maintained. Incident reports, for example, if there has been a security failure, a report that identifies what the failure was, when it occurred, and how it was handled and possibly corrected. To perform internal audits on a periodic basis, you need to define the scope, criteria, frequency, and methods. You also need the procedure that identifies the responsibilities and requirements for planning and conducting the audits, and for reporting results and maintaining records. The results of an internal audit should result in identification of nonconformities and their related corrective actions or preventative actions. ISO27001 lists the activity and record requirements related to corrective and preventative actions. If implemented properly and with management buy-in to the process the value that ISO27001 can bring to your organisation can be significant. An organisation’s ISMS is influenced by the needs and objectives, security requirements, the organisational processes used and the size and structure of the organisation. It is essential that any security arrangements that are to be implemented relate to (or support) overall organisation objectives and strategy. They must be productive and reflect stakeholder requirements. Understanding this relationship enables you to adopt strategies and make recommendations that will promote the business and for information security to enjoy the support of top management. An Information Security Policy is the cornerstone of an Information Security Management System. It should reflect the organisation’s objectives and the agreed upon management strategy for securing key assets. In order to be useful in providing authority to execute the remainder of the Information Security Management System, it must also be formally agreed upon by executive management. The policy document is exactly that – a high-level statement of the organisation’s position on the chosen topic (the “why”), not to be confused with the procedural documentation which deals with “how” the policy is to be enacted. Procedures are sometimes necessarily much longer documents if they are describing complex processes which must be followed. Ideally, the policy should be brief and to the point about the user’s responsibilities towards the information they collect, use, access or otherwise process, and to sign-post them to the other relevant policies and procedures for the areas in which they operate. Setting the organisation goals and tracking whether they have been achieved – the same mechanism is laid down in both standards, so management will be used to such systematic planning. Management review – the principles for management review are the same for both management systems. Document management – the procedures used for document management can be used for the same purpose in ISMS with minor adjustments. Internal audit – the same procedures can be used for both QMS and ISMS, although you might use different people. Corrective and preventive actions – the procedures used for QMS can be used for the same purpose in ISMS. Human resources management – the same cycle of HR planning, training and evaluation is used for both management systems. Therefore, if you have already implemented ISO 9001, you will have an easier job implementing ISO27001 (and vice versa) – you could save up to 30% of time. Further, you will have cheaper certification audits since certification bodies are offering the so called “integrated audits”, which means they will do both ISO 9001 and ISO 27001 in the same audit, charging you a smaller fee compared to separated audits. In order to comply with ISO27001 an organisation must define a risk assessment methodology for Information Security risks. They must identify criteria for accepting risks and identify the acceptable levels of risk and develop a Risk Treatment Plan to bring all identified risks to an acceptable level. Identify all assets of the organisation relating to information security and compile an Asset Register. Identify combinations of threats and vulnerabilities relating to the asset, and then identify the impacts that losses of confidentiality, integrity and availability may have on the asset using an Asset Risk Assessment Report. The impacts take into account the business, legal or contractual obligations that the company has. The assessment then looks at the likelihood of the security failure occurring by a combination of the frequency of the threat and the likelihood of success. Low Risk: No immediate action required although there may be improvements in processes/technology that reduce the impact of the security failure further. Medium Risk: Must be included in the management review of the ISMS with actions identified if required and inclusion in the Risk Treatment Plan. High Risk: Must be included in the Risk Treatment Plan for positive actions to reduce the risk. Selecting the most appropriate risk treatment option involves balancing the costs and efforts of implementation against the benefits derived, with regard to legal, regulatory, and other requirements such as social responsibility and the protection of the natural environment. Decisions should also take into account risks which can warrant risk treatment that is not justifiable on economic grounds, e.g. severe (high negative consequence) but rare (low likelihood) risks. The ISO27000 family of Standards is broad in scope. As technology evolves, new standards are continually being developed to meet the requirements of information security. ISO 27001 is a specification. It sets out specific requirements, all of which must be followed, and against which an organisation’s Information Security Management System (ISMS) can be audited and certified. All the other Standards in the ISO27000 family are Codes of Practice. They provide non-mandatory best practice guidelines which organisations may follow, in whole or in part. Continually assess changes in threat and risk to information security issues. Effective Penetration Testing involves the simulation of a malicious attack against the security measures under test, often using a combination of methods and tools, and conducted by a certificated, ethical professional tester. The resulting findings provide a basis upon which security measures can be improved. As part of the Risk Treatment Plan, ensuring that controls that are implemented actually work as designed. As part of the ongoing corrective action/preventive action and continual improvement processes, ensuring that controls continue to work as required and that new and emerging threats and vulnerabilities are identified and dealt with. A key element of ISO27001 is the organisation’s context both internal and external with regard to information security. A deep understanding should be gained at the outset of an ISO27001 implementation and reviewed at least annually or when any major changes occur – e.g. changes to regulations. Your ISMS Project Team should be drawn from senior managers from those parts of your organisation most likely to be impacted by the management system and should also include some functional areas such as IT, facilities, procurement and HR, but absolutely should not be owned or driven by IT. Ideally you would also have an experienced project manager and a board level sponsor that is actively engaged and who chairs project boards. According to the recently published Information Security Breaches Survey 2014, commissioned by the Department for Business, Innovation and Skills (BIS) and conducted by PWC, Cyber attacks have continued to grow in frequency and intensity over the last year and the focus seems to have shifted back towards large organisations. The proportion of large organisations that were successfully hacked continues to rise – up to nearly a quarter of respondents this year. One in four large organisations reported penetration of their networks, up by 4% from a year ago. More worryingly, most of the affected companies were penetrated not just once but once every few weeks during the year – nearly a tenth of those affected are being successfully penetrated every day. Small businesses experienced fewer outsider attacks with 12 % of them being penetrated (down from 15% last year). Different industries experience different levels of network penetration attacks. Telecommunication companies were the most affected; nearly a quarter of them reported penetration. Roughly one in six utility companies and banks were also affected. Investing time and resource upfront with Senior Management, Key Stakeholders and carrying out robust risk assessments within the right contexts will pay dividends on a number of levels. Implementing ISO 27001 requires careful thought, planning, and coordination to ensure a smooth control adoption. The decision of when and how to implement the standard may be influenced by a number of factors, including different business objectives, existing levels of IT maturity and compliance efforts, user acceptability and awareness, customer requirements or contractual obligations, and the ability of the organisation to adapt to change and adhere to internal processes. The more prepared you and your people are to comprehend the need for implementation, accept that some processes will require change and have the commitment to make it happen, the better the results for your organisation. I hope that this A to Z of Information Security hasn’t put you off! As you will have seen, there are significant benefits both from a business protection basis and that of bringing on new business. For smaller businesses, based in one building with less than 20 employees, the implementation process doesn’t need to be too arduous and can be completed within a few short months and doesn’t need to cost a fortune. It is a requirement of UKAS accreditation that the certification body does not provide consultancy services which it then itself certifies. Oak Consult can work with you to implement an Information Security Management System that will be fit for accredited certification. As part of our service, we will help you select a certification body whose fees will be appropriate and who can respond appropriately to your need for certification. I hope you enjoyed this A to Z. 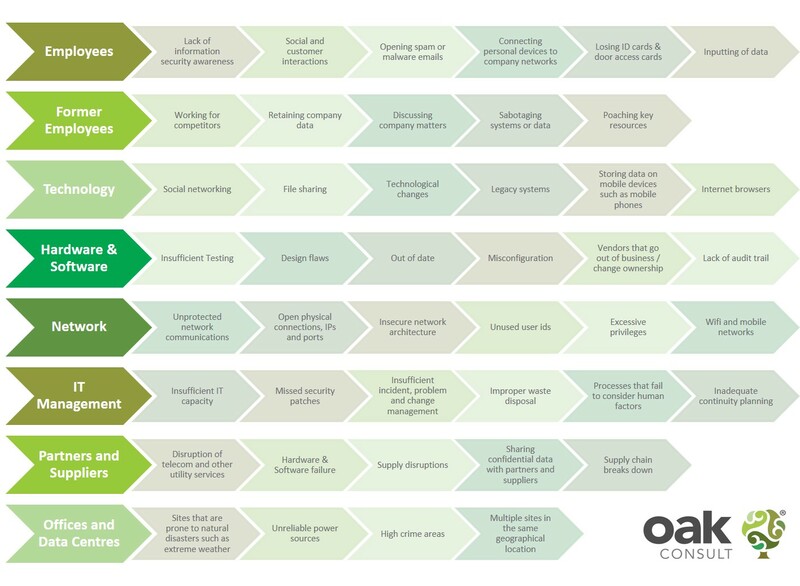 To find out how Oak Consult can help you implement an Information Security Management System, click here.